“Searching” is pieced together via text messages, Skype calls and other online interactions. A pleasantly gimmicky movie, it gets its power from something that isn’t a gimmick at all: an actor’s ability to simply and movingly tell a story. Rating: 3.5 stars out of 4. “Searching,” a pleasantly gimmicky movie, gets its power from something that isn’t a gimmick at all: an actor’s ability to simply and movingly tell a story. John Cho plays David Kim, a widowed dad who’s panicked when his teenage daughter Margot (Michelle La) goes missing. With the help of a tough-minded but sympathetic detective (Debra Messing), David begins to backtrack through the tangled web of Margot’s digital life. Though the movie takes place only over a course of several days, David ages before our eyes; Cho, through the blur of the computer screens on which the movie unfolds, seems to be slowly disintegrating from grief, exhaustion, and quiet desperation. 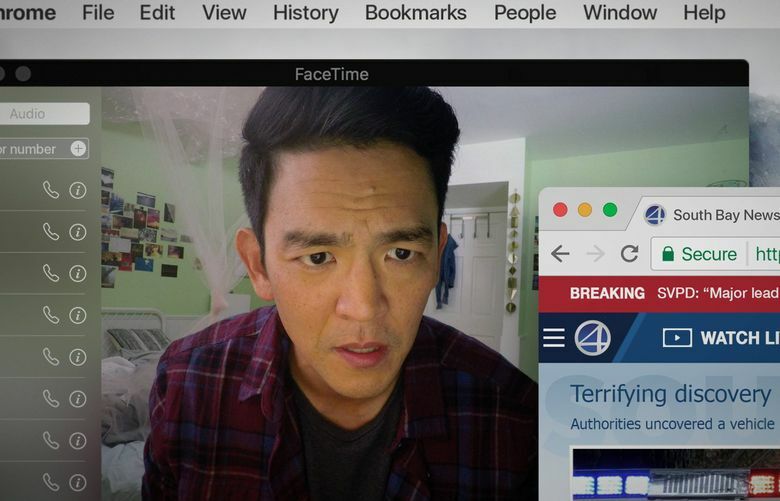 Like (but far superior to) “Unfriended” a few years back, “Searching” exists in an entirely digital world; the story’s pieced together via text messages, Skype calls, YouTube videos, Facebook pages, saved photos, webcams, Google searches and other online interactions. (Life offline, in this movie, doesn’t exist.) We follow David, breathlessly, down virtual rabbit holes: mysterious Venmo payments, ominous texts, a live podcast site where Margot’s been making connections. Much of this is new to David (“What’s a Tumblr?” he asks), who’s increasingly confused by what he finds on Margot’s laptop. “I didn’t know her,” he says eventually, in a broken voice. The last act feels a little rushed, a little less precise than the rest of the film, but no matter; “Searching,” the first feature from writer/director Aneesh Chaganty, ticks along irresistibly, never feeling trapped inside its concept. (One of the film’s clever ways of showing us David’s state of mind: We see the texts he almost sends, and then deletes.) A cursor perpetually blinks somewhere on the screen, like it’s thinking, giving the movie a giddy pulse. And it’s a great showcase for Cho, as both dream dad and online gumshoe. Like the best of thrillers, you watch breathlessly, slipping into the characters’ darkness, hoping for the light. ★★★½ “Searching,” with John Cho, Debra Messing, Joseph Lee, Michelle La. Directed by Aneesh Chaganty, from a screenplay by Chaganty and Sev Ohanian. 102 minutes. Rated PG-13 for thematic content, some drug and sexual references, and language. Opens Aug. 31 at multiple theaters.